There is no better commentary on the draw of Italy than Bill's love of it now. The "now" is all important as Bill had the closest thing to a panic attack our first 24 hours in Italy in 2001; now it is indisputably his favorite country. Scenery like this keeps us coming back to Italy. We'd headed out of the US in a hurry in May of 2001. The lifestyle change to becoming full-time cyclotourists had been on the books for several years, but it had been a slow process to implement. There'd been that nasty lawsuit that kept Bill working a couple of extra years. There was the long journey of dismantling complex adult lives that had been a 30 year construction process. I had a too-slow recovery from a head injury in the summer of 2000 that made everything more difficult. But the ultimate contingency factor in our lifestyle change had been seeing our one-and-only dog through to the end of her life, and that too was protracted. The life expectancy of Vizsla's is 11-12 years and our sweety almost saw 15. But when she passed on, the flag dropped and amid our grief we scrambled to bring rapid closure to our first lives. We had planned on selling our home, but that was 1 loss too many at the time and we put it on the rental market instead. In less than 6 months after our final goodbye to Nikki, we headed out from Frankfurt on our bikes for a new, uncertain life. Unexpectedly, Bill's 3rd generation German heritage gave him more ease with the culture than he'd imagined possible. And his years of long-ago German language study gave him additional comfort in reading German signs though he was too shy to converse. The weather was lovely when we arrived in Europe and the abrupt shift into this new world was off to a great start as we meandered along the excellent network of riverside bike routes. And then it started to rain. It was one of the rainy nights when we took refuge in a hotel so as to dry out our soggy tent and gear that the thought of making another abrupt change hit. We could see the train station from our hotel window and realized we could be in one of those warm, dry train cars. We quickly hatched a plan to head south to Italy to escape the monsoons that had the slugs carpeting the bike paths like they were grass. Verona, Italy was on the main train line and it became the arbitrary destination as surely it was far enough south to escape the rain. Unlike the efficient, welcoming train stations in Germany, we couldn't even determine in which direction to point to find the center of town when we stepped out of the Verona train station at midnight. The place was deserted and we felt stranded and helpless in the barely lit parking lot. It was over the next hour that several clear, innate differences between Bill and I surfaced. Bill had been the leader in Germany. He was comfortable there; he had a rough route plan and I had just followed. I was so much the follower that I'd felt a bit vulnerable as I was always 1 step behind in every way. But in Verona, all of those previously underappreciated sources of comfort for Bill in Germany evaporated and their sudden departure left him immobilized. After a bit of floundering, we struck out from the train station with me in the lead and we found our way into the city. Soon there were little signs to our hotel, but too many of them, as we realized we were going in circles following them. The more we looped around, the more agitated Bill became. The rampant uncertainty in Verona had displaced some level of predictability in Germany for Bill and he hadn't known to brace for the change. I however had been the clueless follower in Germany, so proceeding with little knowing wasn't a change for me. And my ever-present need to 'get going' makes it more comfortable for me to charge ahead and adjust as I go than it is for Bill. He doesn't like my 'bumper car' approach to navigating and prefers the reassurance of following a plan. Eventually our circles got smaller and we arrived at the hotel only to be told there was no room for us, despite having called ahead for a reservation from Germany. A guest had become ill and had been unable to leave. The friendly young hostess had arranged for a room for us at another hotel but we were in no mood to wander the streets again. But her directions were sufficient and our harrowing, endless night (of an hour or so) drew to a close. The next morning was bright and hot but Bill was still in shock. His rusty ability to read German was useless in Verona whereas my brief exposure to Spanish as a 13 year old was of some help with Italian. Our role reversal from the night before stuck as Bill again restlessly took on the clueless follower position for days. Bill's jarring experience with arriving in Italy has become a legend in our traveling lives and given how upsetting it was, it's amazing that he remained. But to his credit, he hung-in there as we toured central Italy that summer. Despite the horrible first experience in Italy that was so sharply contrasted with his very positive experience in Germany, Italy has displaced Germany from the top slot and Italy is now his favorite country. We estimate that in our 7+ years of traveling since then, we've spent close to a year of it in Italy, usually a month at at time. One must squint to see Stromboli's lava flows from the sea. Where Are the Aeolian Islands Anyway? There is little reason for most Americans to know about the Aeolian (A-oh-lee-an) Islands. European travelers know of them as they are a hot destination for beach-goers but Hawaii, Mexico, the Caribbean, and the Greek islands are on more well-worn paths for Americans to follow for a similar seaside experience. The Aeolians are so small that they hardly show as dots on a map of Italy drawn on a standard sheet of paper. Together, they only constitute 34 square miles of land and have less than 13,000 residents. They are far south, just above the eastern end of Sicily off of the west coast of the toe of the boot of Italy. All the literature says that there are 7 islands, but we don't know how they then account for the other smaller ones. Stromboli is the 1 you've mostly likely heard of as it is home to the volcano of the same name that has been largely continuously active, though often in a fizzling way, for 2,000 years. Vulcano must have given it's name to all volcanoes, so we've all heard of that island indirectly. Lipari is by far the largest and most populous and commercially significant island of the cluster, though I hadn't heard of it until we were a few days from setting foot on it. 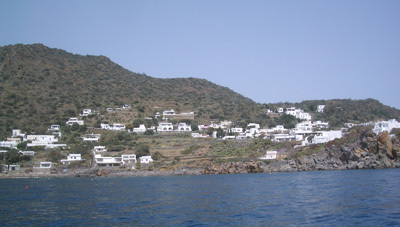 The other islands in the archipelago are Panarea, Alicudi, Filicudi, and Salina. Stromboli is a big name in the world of geologists and its name is used for a type of volcanic activity. 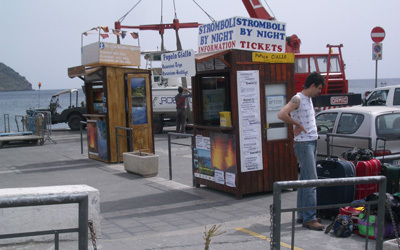 But despite the grand recognition of its name, Stromboli and its cousins are small, small islands. 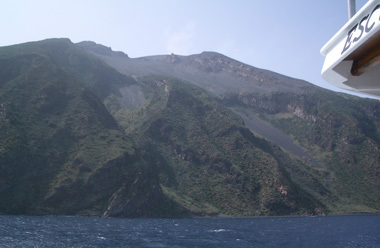 Stromboli only occupies about 5 square miles, with its companion islands ranging from Panarea's mere 1.3 square miles up to Lipari's 14.5 square miles. "Must be Germans...." on 1 of Lipari's isolated beaches. Your interests will determine whether and why the Aeolians are significant, with their biggest fans being sun-lovers, archeologists, and volcanologists. For the beach goers there are the lovely blue waters of the Mediterranean; ample but low-keyed tourist services; and private-feeling pebble beaches in pretty coves, many of which require a water taxi to access. For the archeologists there are the fascinating Neolithic ruins revealing a wealthy and flourishing trading network 6,000 years ago. The rare obsidian on Lipari was the source of its wealth and power until the Bronze Age made obsidian tools old technology about 1800 bce. And even more intriguing, Lipari had just the right combination of wind and airborne volcanic grit to rapidly increase the height of the ground level over thousands of years. This even coating of about 30' of grit makes it especially easy for archeologists to precisely date their finds. The volcanologists get an idyllic setting for their research of a 120 mile chain of volcanoes between Sicily and the Italian mainland. The Aeolians are marine volcanoes as most of their 10,000' height is underwater and at most, about 3,000' are above water. Their marine nature also explains the odd experience of smelling sulfur bubble-up from the middle of the ocean as we did our our boat trip from Lipari to Stromboli. For us, the Aeolians were appealing for all 3 of their major attractions. They would provide a new area of Italy to explore on our bikes in the early spring--a place where we had some hope of being warm and not too wet. 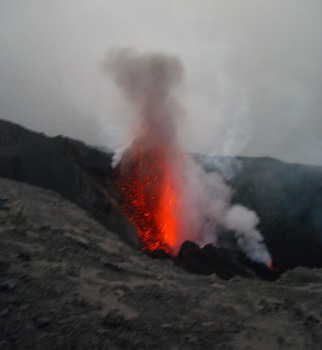 We knew too that the ancient history supported by a good museum and the accessible volcanoes would captivate our minds. The Aeolians didn't disappoint us but I must say that our first minutes on the islands brought other images to mind, which were of Greece and New Zealand. The Greek island look prevailed on Panarea too. Our first impressions of Lipari, our starting point in the Aeolians, were like flashbacks from being in the Greek islands. Low but very steep slopes precipitously dropping to the sea covered with dry, scrubby vegetation was the first memory jog. As we drew closer, it was the placement of the squat, white, boxy buildings around the small harbor of a sleepy town bathed in sun that cinched the Greek look. It was when we hit the pavement at the port that New Zealand came to mind. Many firms competed to provide tourist outings like in New Zealand. 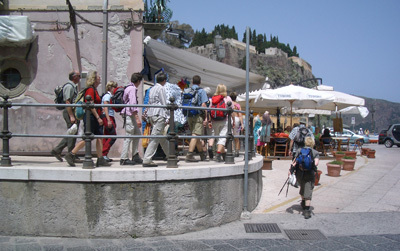 In the mornings, like in New Zealand, packs of outdoor sports people filled the cobbled streets of Lipari town heading for the harbor to begin their prepaid activity package. Boots, hiking pants, plaid shirts, big cameras, walking sticks, and backpacks made the mostly German and French speaking tourists look out of place, except for the fact that the large numbers of us overwhelmed the local population, even in low season. No doubt in the summer months the look of the processions shifts to that of flip flops, big hats, and beach bags--the essentials for a day on a pebble beach only accessible by boat. Tourists fell into 2 main camps: there were those who, like us, parked in one place and took day trips to the other islands or those who uprooted and hauled their gear with them to each island. 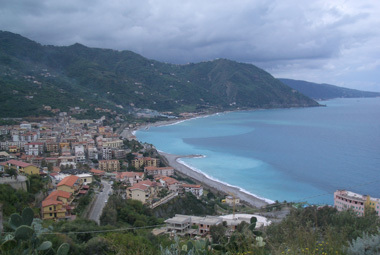 For either style of tourism, Lipari where we based, was the hub. It's the main sea connection with Sicily and the mainland and it has boat companies serving each of the other islands. Being in Lipari made the most sense for us as the services on the other islands were more limited to begin with and were very slim in the off season when we were there. A pack of outdoor adventure tourists heading for the harbor. It was ironic that the motorized predecessors to fleets of tourist boats that we relied upon had triggered 1 in a series of modern disasters that the Aeolians endured. When the sail was the rule, as it was for thousands of years, Lipari was on the commercial route between Sicily and the Italian mainland. But in the 19th century that all changed with new routes better suited to motorized seagoing vessels. The Aeolians withered as they became has-been's on the new engine-powered seafaring circuit. They suffered a subsequent economic set-back with the introduction of a parasite (rumored to have been brought by the Americans) that devastated their vineyards. Those events lead to an exodus of the island's inhabitants to the Americas and Australia that has only been reversed in the last 10 years as tourism has become the primary economic activity, tourism that depends on the once cursed motorized boats. But despite the islander's utter dependence on the tourists, the tourists get their share of modern maritime challenges amplified by the locals. The website for our Lipari accommodation made it clear that the mandatory credit card deposit of a night's stay would be collected even if foul weather prevented our arrival to the island by boat. 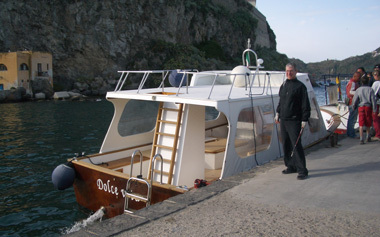 Bill lingering by 1 of our water taxis at Lipari. The absolute reliance on boats for transportation had me paying a bit extra for small local firm's round-trip package for our first outing to a nearby Vulcano island presuming it would reduce the risk of being stranded by some unexpected issue with the regularly scheduled shuttles. But a few days later when using the same small firm for an all day outing to Stromboli, the captain buzzed out of the harbor ahead of schedule without Bill. Fortunately his frantic waving was noted by other passengers and the small boat with only a handful of clients returned to scoop him up. An Australian couple told an even more disturbing 'commuter' story the day we met them at Salina. Their 8 am boat that provided regularly scheduled service to 3 different islands was late. When the boat docked at Lipari, the captain announced that he was only going to the first island, the closest one. The bands of eager hikers all geared up for their big day on Stromboli island weren't allowed to board and the boat that could seat hundreds took off with only 6 customers. The abandoned hikers were probably able to get a boat with another ferry line in an hour or 2, but a couple of hours delay can ruin a key vacation event on these islands. Staying a day longer isn't always an option either as most everyone was like us, boxed in by fully-booked accommodations because of an upcoming holiday and by highly variable weather conditions that could prevent a sailing. The dependence on boats to get between the islands also added considerably to the cost of the stay in the archipelago. The cheapest price for visit to an island about 10 minutes away by boat was $16 per person, round trip. An island a half hour away incurred a $25 fee per person, with the farthest outing we took to Stromboli running closer to $50 each. By comparison, lodging per person was in the $30-40 range (1 Euro = $1.60). At those prices, one didn't mindlessly hop over to an other island for an hour or 2. The vulnerabilities of tourists to the maritime industry was underscored when we left Lipari for the last time as we almost missed our boat. We were there in plenty of time but our boat wasn't there. Five minutes before departure time I returned to the office and asked in the sparest of Italian "Has the boat arrived?" "Si, si" was the response as he pointed to competitor's vessel. We were dumbstruck. We were supposed to get on the other line's craft that looked like it was headed to Palermo, the other direction? "Yup, that's what we were supposed to do but how were we to know that?" We scurried towards the nearby craft with our loaded bikes and "Si, si" was the response when we asked if they were going to Milazzo. No problem for him that we had the other company's ticket. It must happen all the time but too bad they didn't mention the little detail to us and at least 1 other family scampering on to the boat. We nervously asked several more times to make sure we were on the correct boat and had to wonder how many people missed it, presuming it was late as they often are. Our other surprise was that the ferry laid over for too close to an hour at the next island that was only minutes away. We had a 30 mile bike ride ahead of us after we docked at our port, so which side of noon we actually got underway made a difference to us. 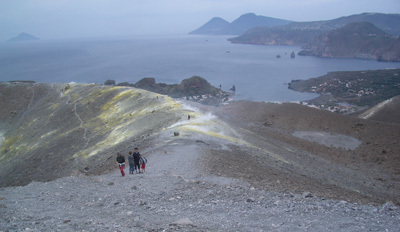 Getting above the gagging fumes on Vulcano's sulfur coated rim. But despite the challenges and expense of the water taxis around the islands, we enjoyed our visit to the Aeolians and would happily have extended it had lodging been available. However, our ambitious plans for hiking, biking, and walking on all 7 islands shrank considerably as a bad cold set up roost in Bill. He often feels like he's been hit by a truck when he gets a cold, and this was 1 of those colds. Our first outing in the Aeolians was to the top of nearby Vulcano island and that was Bill's last big effort for the week. He struggled up the steep grades gasping for air like he was on a loaded bike. The fierce winds once at the rim compounded his misery as it was all we could do to stand up much of the time. But despite the obstacles it was a thrill to tromp around on an active volcano still spewing out potent billows of sulfur-laced steam. For the time, money, and effort our visit to Vulcano was the best value in the Aeolians. I was alone several days for my 2 hour fitness walk on Lipari while back at our room, Bill focused on breathing. Unfortunately as often is the case in Italy, much of the land on Lipari is fenced and gated, so my long walks weren't on pastoral trails but on the main road. The lack of shoulders or sidewalks made it a bit dangerous and it clearly wasn't the thing to do as my presence on the road triggered many stares (or maybe it was the sun hat). 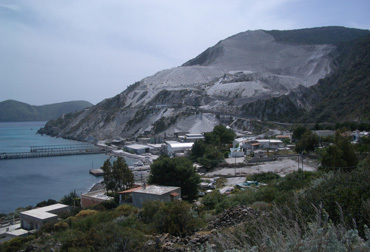 The recently closed pumice mines of Lipari. Towards the end of the week, Bill joined me on a bus-and-walk outing to the north end of Lipari to view the now dis-allowed pumice mining. We took the local island bus to the end of the line, walked part way back through the mining area, and then flagged the hourly bus for the remaining trip into town. Had he been healthy, we might have walked the entire route or ridden our bikes but as it was the outing was at his limit. The well-done archeological museum was close enough to our Lipari room that Bill could both walk to it and still have enough energy to visit the exhibits. Like many Italian museums, no photos were allowed so we can't share those images. 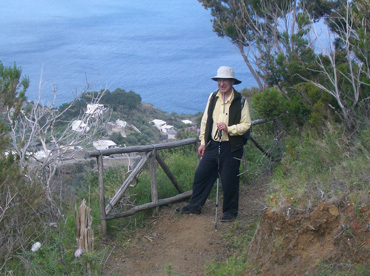 Walking to near the top of Stromboli at dusk and hoping to see it blow is the tourist activity in the Aeolians. They attempt to make it mandatory to do the trip with a guide, which I obliged in doing. Bill felt so weak that he was barely up to the long journey to the island by boat but decided to go along at the last minute. We traveled the many hours to and from Stromboli together and split up for the middle part of the outing: I hiked to the top with a group and his time was divided between entertaining himself on a bench on the small island and viewing the small eruptions after dark from the sea. Nabbing an outburst on Stromboli at dusk. The hike to the top was another one of those forced march, group outings that annoy me. I'd be happier arriving at the same time, but at my own tempo. As it was, the few pictures I took on the way up were on the fly as the guide's stops corresponded to his timetable, not mine. But I was glad to have the guide for the descent in the dark as charging down the steep, mostly sand dune-like terrain was challenging. I had to agree with 1 of the Dutch women that the best fun of the outing (for a while anyway) was the experience of rapidly descending in sand in the dark. I drew upon the technique we learned in the Dolomite scree in which one practically runs, landing strongly on your heels so your weigh sinks your foot deep into the loose surface. One can travel amazingly quickly and securely with this technique as long as you don't unexpectedly hit solid ground, in which case you go skidding. The loose pumice and volcanic sand was reliably thick for long intervals, making it easier descending than on the scree in the Alps. We'd originally planned to visit all 7 islands, but Bill's illness and the difficulty of arranging a 1 day outing in the off season to 3 of the 4 remaining the islands ruled it out. We settled for a short hike on Salina island our last full day in the Aeolians. Bill was on the mend, so seeing Salina seemed the best compromise. Salina is touted as the greenest of the 7 islands, a feature afforded by its springs that happen to be most prolific in the summer months. We however found ourselves cursing the thick overgrowth that the extra water provided as we searched for a trail head. It was only later, after talking to 3 young Dutch men who were certain it was the correct trail, that we were convinced we had all been on the wrong trail. Bill on the correct Salina island trail . We will remember Salina for the well-groomed, scenic trail that we only saw part of as we'd burned up most of our day on the wrong overgrown and somewhat dangerous trail. We practically ran up it once we found the correct trail as we wanted to see as much as we could before our boat back to Lipari departed. We did learn later from other tourists that we had walked on the prettiest part of the real trail. Renting a tourist apartment for a week in Lipari gave us a bit more of an authentic Italian cultural immersion experience than we were looking for. Ours was an apartment on the second level above the owners. We had a separate front door and a separate stairway to access our space, but our host had a connecting door between his apartment and our stairwell. It became a daily ritual that I dreaded, the sound of his voice saying "BAA-ba-rah" followed by a string of Italian sentences like he thought I understood. On our first afternoon that "BAA-ba-rah" rang-out in the stairwell, our host handed me a local guide book in German. I graciously thanked him, knowing that people often figure that if you don't speak their language, then any other foreign language will do. But the next time I heard "BAA-ba-rah," we were in trouble. Our tiny "angolo cotura" kitchen in Lipari. 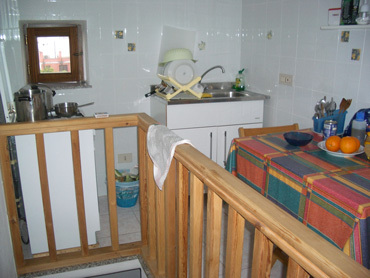 The next morning I darted out onto our semi-private stairwell from our sleeping room to access our "cucina angolo" or corner kitchen a half flight of stairs up and a very agitated "BAA-ba-rah" greeted me at 7 am. Something about shutting off water, something about the balcony, was all I could get. I remembered that there was a little sink on the terrace up a half level from the kitchen and thought perhaps that faucet was dripping. As I headed up, Giovanni added more clarification: something about the heater, water on the balcony, turning something off. Bill was in the stairwell now and he put the pieces together--our air conditioner/heater unit must be dripping water onto the balcony and then on to Giovanni's space below us. We flipped the HVAC unit off and opened the outside door and sure enough there was a bit of water on our little balcony, a balcony that was critically positioned over his clothes line, a line with laundry on it. I mopped up the balcony in disbelief as I had carefully inspected the drainage line for the heating unit when we arrived. Often these units have an attached hose that drains condensed moisture, usually into an old water bottle, and I figured we'd be ahead to keep that thing emptied during our week's stay. But we were in luck, as our hose was connected to a PVC pipe that dripped into a garden area. So having done my homework, I was mystified as to why the unit was dripping water on to his laundry via our 2' wide balcony. We also wondered how we'd run the heater on the cool evenings without causing a problem. I fretted that Giovanni would snitch our remote control for the unit while we were out the next time and we'd be cold at night for the rest of our stay. Giovanni's patio clothes line beneath our tiny balcony. Luckily for us, Giovanni knew that the unit was malfunctioning, which explained why it hadn't been a problem the first night. He apologized profusely for invading our space during the sacred siesta time later that day, which of course was an non-issue for those of us accustomed to engaging with the world in the middle of the afternoon. He wasn't going to snitch our remote but instead was very prompt in having the unit repaired. The next morning I'd hoped to dart out with a quick trip to dump our garbage and buy bread for our outing but "BAA-ba-rah" again caught me before I made it out the door. I was beginning to feel like a naughty teenager trying to sneak out without the folks noticing. This time Giovanni was offering fresh towels, which was welcome. But I couldn't just take the towels and run, I had to collect the other sets so he could wash them. Just a little delay for our benefit, but darn-it-anyway, I had launched into my own set of plans and resented having to conform to Giovanni's time schedule before going out the door. I grumbled to myself that "Barbara" is a familiar name in western European languages: the pronunciation changes, though the spelling does not. "Bill" on the other hand doesn't compute with anybody in Europe and even "William" becomes unrecognizable, so "Barbara" gets retained from the introductions. In addition, I am a little quicker with free-associating Italian words, so I often can guess what someone is saying to us in Italian before Bill does. Those 2 factors I'm sure combined to make me the "go-to" person for Giovanni. Fortunately, I got a couple of day's break after that and only heard "BAA-ba-rah" 2 more times. The too-close neighbor experience with Giovanni heightened our awareness of tight urban living etiquette. Our water-on-the-laundry experience reinforced our emeshed relationship with Giovanni, our lower-level neighbor and landlord. Clearly there could be no casual sweeping of the heater repair debris off the balcony; it would have to go into a dustpan to spare Giovanni's space below. 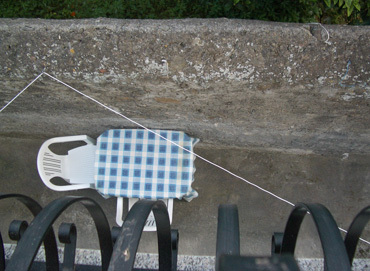 And clearly we shouldn't put dripping clothes on our clothes line strategically poised over his line and table below. We are habitually careful about not banging or dropping things on the hard floors to spare the neighbors ears, but now we had outdoor space to manage in a community-friendly way. The backyard 'smoldering' next door lasted for days. Unfortunately the care we took of Giovanni below us wasn't given to us by the across-the-alley neighbors. We had neighbors on each side of us building smoldering fires of green cuttings that had us rushing to close our windows and doors and abandon our little balconies and terrace for days at a time. 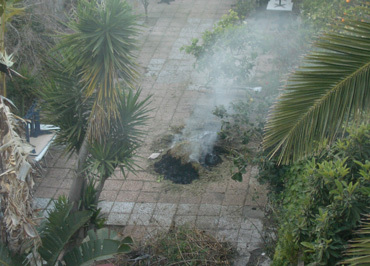 The usually unattended heaps would billow smoke for 24-36 hours at a time. Giovanni commented on it, but clearly felt he had no recourse, which was astounding in a high-density old town environment. Refreshingly in the Aeolians, we didn't see grand roads built that went nowhere and massive bridges built over land that seemed not to require a bridge. We didn't see the extra people hanging around nor were there grim looks on the faces of the locals. Instead, there was a higher level of trust and goodwill. I rented the boots required by the guide for my walk up Stromboli and the clerk took my $9 and first name. Her rental business would be closed when we returned at 10 pm so I was to toss the boots over the high wall to the shop's back patio--that was it. That seemed to be her standard procedure as the next customer was to do the same with his rented trekking poles. Reluctantly, we packed up our gear, loaded our bikes, and said goodbye in Italian to our host Giovanni. The 'removed from the world' charm of the Aeolians had enhanced us like so many others and it was hard to leave. We would have happily extended our stay, perhaps for another week or more, had yet another upcoming holiday not already made lodging tight. We hadn't seen as much of the Aeolians as we'd anticipated and the frequently hazy skies had crimped our photo taking, but we'd had a satisfying visit. Bill was recovering well from his cold so we could confidently make reservations in Messina for the holiday weekend, which was several days off. We made our last journey to Lipari's harbor, hopped a boat to Milazzo, and planned on continuing our eastward journey by bike along Sicily's northern coast. Yet to come would be a string of the 'must see' ancient historical sites on the island. The cool, wet spring in Europe affected Sicily too and we were able to stay there longer than expected but by the time we were ready to leave, the temperatures would soon be surpassing the 100°F mark. To depart the island, we rode from the western end of the southern coast of Sicily over the inland hills to arrive at Palermo on the northern coast. We caught an evening ferry in Palermo to Genoa on the west coast of Italy. The next night it was on to Barcelona on a second overnight ferry. After a couple of orientation days in Barcelona, we pedaled to Perpignan, France so as to enter the Pyrenees from the French side. We are currently applying our typically zigzagging route east to west through the Pyrenees, occasionally crossing the Spanish-French border. If you are hungry for the minutiae about our Pyrenees route, click on "Country Details / Pyrenees" (or click here Spain - Pyrenees) as I am writing a daily journal about hiking and biking in the mountains. This detailed route information will be updated on our webpage each time we find an internet connection, which currently is 1-2 times per week. The more usual travel log (vs this biking diary) will be available later on after we upload all of our Sicily files.